Did you know that many of the American fly fishing companies make products specifically for the Japanese market? While they go back and forth on whether the products are also offered here, this goes a long way toward explaining how some products came to be. Insiders at Sage explain that the Japanese market tends to focus on the high-end (at least with American brands). Because Japan has lots of small-stream water, their tackle also tends to be on the light side. Sage’s TXL 00 and 000 rods and the corresponding Click 1 and 2 reels–while available here in the States–were primarily created to meet Japanese demand. Meanwhile, Scott Fly Rods actually makes Japan-only equipment. A thirteen foot eight weight G2 “Spey” rod–the only one offered in the lineup–is only available through Japanese dealers. Scott Rods’ bamboo builder Bernard Ramauskas also once told me that if he didn’t make a conscious effort to hold some of his rods for the American marketplace, “they’d all just go right into the hands of Japanese collectors.” You can see some of Scott’s Japan-only rods through their Japanese dealer‘s site (but you might need to download a special font to load it). 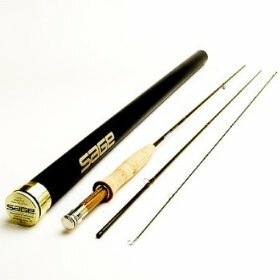 Do you know of a special overseas rod or reel model? Fill us in in the Comments section!